Basic the Microsoft© basic ROM "M25126AA", "PX4 BAS"
Utils the utilities ROM "M25124AA", "PX4-UO"
PROMWriter ROM works with the PROM Writer cartridge "C1 P XR"
Px4os1.zip the operating system ROM. Has no file system, but contains code for the main processor, including the CP/M system. "M25121AA", "PO PX4"
px4+os.zip idem for the PX-4+. It doesn't seem compatible with a PX-4, even one with a RAM disk. The label is B0 PXA. 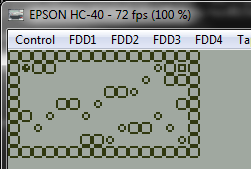 font.zip font file for the HC-40/PX-4 emulator. Will probably also work for the HC-80/PX-8. The FONT.ROM is from Toshiya TAKEDA. 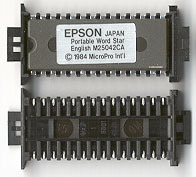 The PX-4 uses special cradles to insert (EP)ROMs, but these are not essential. If you bend all the pins untill they point all exactly downwards, you can insert a EPROM without a cradle. The cradle socket connect pins fixate the EPROM pins. Be careful with removing the EPROM, as too much sideways force might bend the socket connections. The words ROM and EPROM are used almost interchangeble, and in most cases they are. Only if you want to (re)program one there is a difference. With true ROMs, you can't. With EPROMs, you need a eraser (UV-C source) and a programmer.